Once we have setup our environment properly, written the code we are wanting to deploy, and decided how we are going to handle code security for SQL CLR, the remaining steps are very straightforward. Unless we are referencing other libraries that are not part of .NET, but that will be discussed in detail later. Deploy error SQL01268: .Net SqlClient Data Provider: Msg 15657, Level 16, State 1, Procedure sp_db_vardecimal_storage_format, Line 65 Vardecimal storage format is not available in system database 'master'. This is due to the deploy script attempting to enable the vardecimal storage format on master, but you cannot perform this action in master. So, to work around this problem, you will either have to deploy to a different database, or you can implement a new “Database Project” that references your SQL Server CLR Object. This process is described in detail on MSDN, so I will not repeat it. At this point, your SQL CLR stored procedure should be deployed and ready to use on your SQL Server database. Connect to SQL Server through SSMS and connect to the database to which you deployed your code. Assuming that you get no errors, the first Execution should return a “1” because the test String matches the Regular Expression. The second Execution should return a “0” because the test String does not match the Regular Expression defined. I will be adding some more complex objects soon, but in the meantime, I hope that this short tutorial gives you an insight into how SQL CLR can improve your environment. Before we publish our newly created SQL CLR Stored Procedure, we need to take a moment to discuss security. 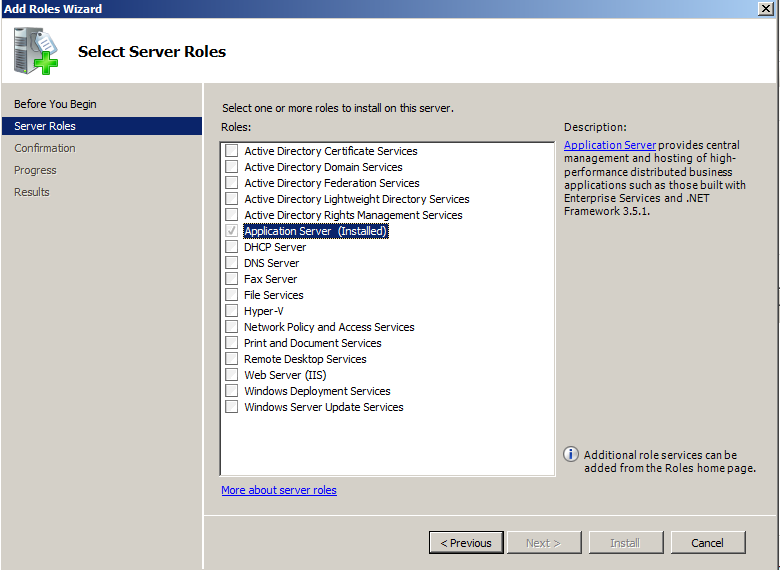 SQL Server is a highly-protected environment. As Database Administrators, we strive to work based off of least-privilege principles to keep the environment’s data secure and trustworthy. Introducing a completely new set of code, running inside of our environment, should make us all take particular caution. Unfortunately, there is quite a lot of debate across the internet about this, in which one side is saying, “Don’t worry about nitpicking over signed vs. unsigned code. Protecting the front door is your real concern.” While, yes, the front door (logins, roles, so forth) is often left vulnerable, shouldn’t we protect the back door, especially when it is a NEW back door that we are opening willfully? The risk is that while signed code is guaranteed to match the code that was originally compiled, unsigned code could be manipulated to inject malicious commands that can be executed with very high privileges, without the DBA being aware at all. This is another subject that could be spoken about for pages and pages worth of text, but suffice it to say, that I believe it is worth the 60 seconds (literally) that it takes to sign your code. If it is so simple, why is there a debate? Because, there are complications that can arise. For one, if you are going to include another library with your code that was not signed, then you cannot sign your code. Signed code requires that all dependencies are also signed. This may be insurmountable. Also, there may be a precedence set within your environment that is hard to overcome. If downstream developers are not on board, and you need to use their libraries in your code, then you will either have to recompile their code as signed code, or convince them to move toward a signed assembly mindset. So, how do I sign my code? Signing code involves asymmetrically encrypting a hash (like a CRC) of the compiled code within the resultant assembly. This enables the calling process to verify that the code has remained unchanged since the developer compiled it. Since we are dealing with encryption, you will either need an existing signing certificate, issued by a CA (like Verisign) or do what is known as “Self-Signing”. I am going to walk through Self-Signing our code, since it is free. 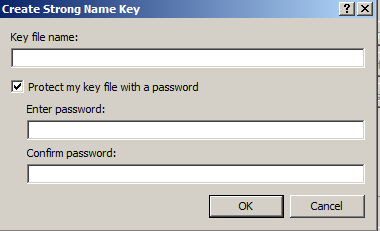 All I have to do in the “Create Strong Name Key” dialog box is define a name for my new key file and setup a good strong password. Once I click “OK” in this dialog box and then save the project, my code will automatically be signed at compile time (as long as I do not have any unsigned references in my code). What if I cannot sign my code? If you cannot sign your code, you are going to have to tell SQL Server that you want it to trust “unsafe” assemblies. You can do this through the ALTER ASSEMBLY command. Now that we have made our decision about signing our code and taken the necessary steps, we are ready to deploy and test our new SQL CLR Stored Procedure. These three components give us an application in which we can write and compile code, a database engine to host the code we will write, and the CLR we need to execute the code. The configuration steps for each component are simple, but I want to review them quickly here. 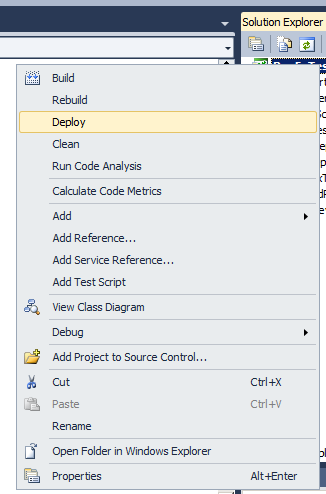 You may need to take particular consideration to setting up Visual Studio with your environment’s source control, but I will not be covering that in this series. Each shop implements their source control a little differently and it would be best to stay consistent with the rest of your development endeavors. 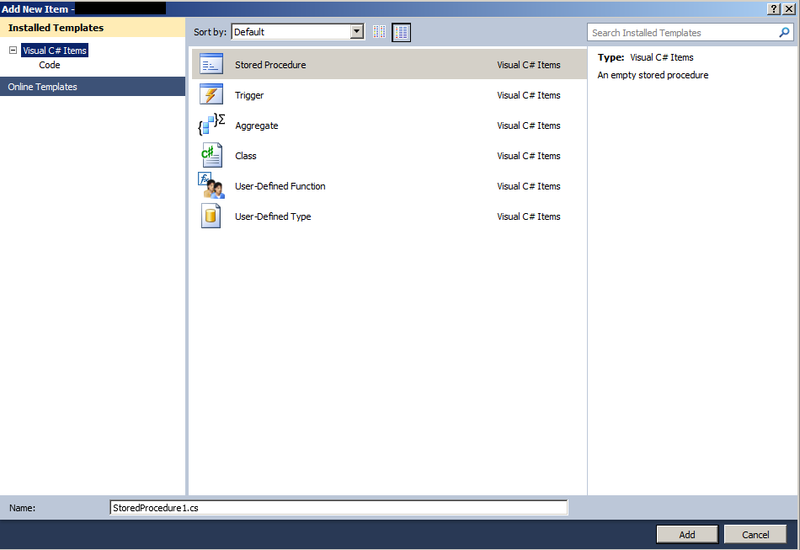 Now we have an environment that is ready to start creating SQL CLR objects. SQL CLR is a feature which allows database developers to create powerful code that can be executed from within SQL statements, utilizing familiar programming languages. 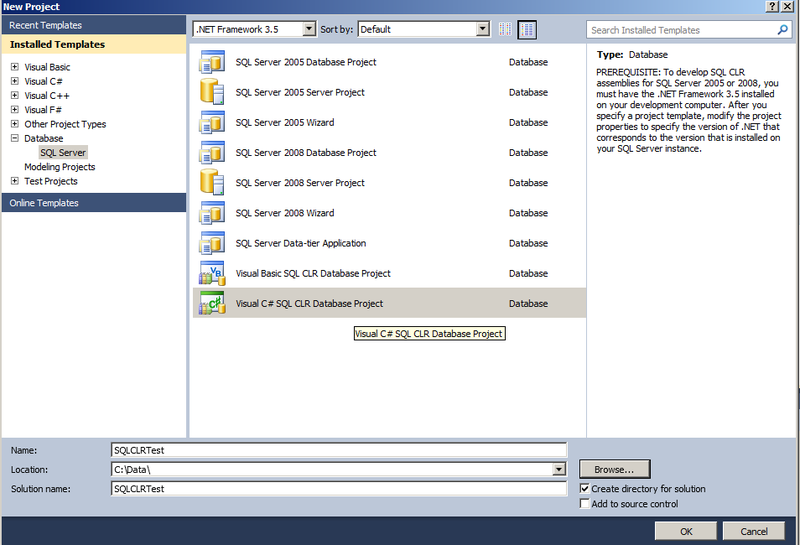 SQL CLR is a feature, added in SQL Server 2005, that allows a database developer to host .NET managed code inside of a SQL Server database instance. The hosted code can then be used within SQL DML statements to execute procedures/methods that were written in a .NET language. To understand what is going on here, a brief understanding of .NET, CLR, CIL, and CLI is useful. Starting in the early 2000s, Microsoft released a set of languages under a common framework, called .NET (Visual Basic .NET, C# .NET, and J# .NET). The intent was to be able to bring a common set of features together from the different leading high-level programming languages at the time (Visual Basic, C/C++, and Java). Microsoft published their own versions of each of these languages (Microsoft already had versions of all of these languages in the market), some being changed more greatly than others. They were all published under one framework so that features available to one language would be available to all, although with different implementations. Each of these languages would then compile down to a common code type, known as Common Intermediate Language (CIL). This is not to be confused with the Common Language Infrastructure (CLI) which is a standard, developed by Microsoft, in conjunction with the .NET endeavor. The CLI is the standard, .NET/CIL/CLR is just the way that Microsoft implemented this standard. This Intermediate Language would then be converted by the Common Language Runtime (CLR) into machine code, which is specific to a particular processor family. Having this relationship between the CIL and the CLR is what makes .NET languages Interoperable and Portable. The languages can be said to be Interoperable in that any language that compiles down to CIL can be linked with other similarly compiled code. When I say Portable, I mean that, theoretically, a CLR-type interpreter (virtual machine) could be created for basically any platform you wish, and that new interpreter would be able to convert that CIL into machine code that would run on that platform. This is where SQL CLR comes back into the picture. The SQL Common Language Runtime hosts a distinct engine within SQL Server that runs the CIL that the database developer has created. This enables programmers to work in the managed languages, with which they are already familiar. They can take advantage of many of the features that are only available to managed and compiled code. It is important to remember, however, that there is overhead in running through the CLR and poorly written or implemented methods can actually cause huge performance problems. Like anything in database development, you have to learn how to use the tools effectively. There are no magic bullets. I will update this post with links to the other blog posts as I write them. I hope that this short series will prove useful to those trying to wade through this technology.